In this interview series where we ask questions to people who are making a difference, it can be big, it can be small, it doesn’t matter, what matters is their contribution to our society. It can be anyone from any walk of life and from any country. Please, do send us suggestions of people whom you think we should interview for this series. Chanchal Malviya is a software engineer, entrepreneur turned educationist. He has authored books titled ‘Education in India Today’, ‘Dharma Unfolded’, ‘The Last Decision – Reflections on Ramayan’, ‘Deva – Symbols of LIFE’ and ‘Culture – The East and The West’. He has initiated a new educational magazine for training parents and teachers titles ‘Education Today and Tomorrow’. He is working on new education model inspired by Gurukul system. I am a qualified software engineer, turned educationist by passion. I started a gaming company ‘Medha Edutainment’ (now renamed as ‘Cympl’) to introduce Bharatiya ideas into mobile games. I often engage myself in writing (Books, articles, poetries, etc.) and public speaking (Conferences, lectures, teacher training, etc.) to connect with people with the sole purpose of developing Bharatiyata in them. I am working on establishing a Centre for Research on Bharatiya Scriptures, to promote both leadership and indigenous works in our nation. What was the turning point in your career when you decided to pursue research into Vedic philosophy and scriptures? I got exposed to social media in 2006-2007, where I was pounded by hundreds of negative questions on Hindu culture. It was the same time, when we all heard a new theory called ‘Hindu Terror’. I realized that few generation down the line, a huge religious and cultural clash would be inevitable and no counter measure was visible. Onslaughts on core Bharatiya culture also hurt my identity so hard that it triggered my inquisitiveness to read Vedic scriptures and texts of other religions. Thanks to Gita Press, that I could manage to study many of our scriptures. I extended my help to an NRI, Dr. Ramesh Gupta, by starting a study centre on Ramayan (Maharaja Aggarsen Centre for Ramayan Studies) in Delhi. Following this I quit my IT profession to work in the field of education. What conclusions did you come to from your research and when did you start thinking about working in the field of education? I must tell you – there is no religious text anywhere in the world that can come near to what our nation has already produced thousands of years ago. Bharatiya scriptures are so deep that they empower you with fundamental abilities like values, creative thinking, decision making, communication, and all that you need for Leadership and Innovation. While reading our scriptures, I found that they are so scientific and logical that we start echoing all western sciences we come across in our text books. That made me think, why are we denying our own studies and making our children mere followers of the West. If our nation has to emerge as a global leader, it will happen only on its indigenous concepts of Vedic learning, maybe in a new blend. And this will happen only through transformations in education. What do we lack in current education system and how can we fill those gaps from Gurukul model? There are many issues, but I will point only two for you. We should understand that reading is a listening phenomenon – whether we read a text book, attend a lecture or watch a TV programme, all come under listening. Listening is the feeder to Thinking. Listening alone is content and not knowledge. It is thinking that translates content into knowledge. Education today does not allow students to think enough – this has to be addressed immediately. No values can be realized without a delivery model. So, if parents have to earn respect from their children, they have to deliver it to their parents in turn. At schools too, values will not find any space without respect for Teachers. However, values today are in books alone and that is wrong. Without values, even skills will not find a good position. So, Teachers have to be developed at all cost. Adjustment with short-cuts like e-learning or similar modules is not going to help. Short-cuts are not answers to nature’s mandated maturity period of 18 years for the child. How are you implementing Gurukul model currently and what changes have you observed in this effort? Macaulay superimposed his negative ideas on Gurukul model to enslave the minds of Bharatiyas. He is more successful today than in his own time. I am doing the reverse of Macaulay again – I am superimposing Gurukul back on his prevailing model. Though everything in the system appears to be the same, they will transform back to excellence. My experience has been that children are coming up with great confidence, originality and eagerness to learn and grow, in our model. Of course, culture is all Bharatiya but awareness is all global in its nature. What are your thoughts on making education affordable and accessible to kids in India from poor or low income households? How do we fight this disparity in education? Before answering that, we must redefine our idea of Education itself. If education means privately run schools with big buildings and great infrastructure, poor people cannot afford that. If Education means, right knowledge and ground level skills, then we can achieve it at any level – we need knowledge and skill transferring social culture. How Aggarwals or Marwadis become great businessmen – it is not through books or Business schools – it is through their traditions. We don’t need to make the whole nation bookish job seekers. We need to make them skill-driven, value-driven and self-sustained. What is more useful to the son of a farmer – laws of motion or techniques of effective agriculture? If the answer is the latter, we don’t find any institute that guides villagers to create an effective economy in the village itself. Unless we decentralize this education model and make it localized, problems of this order will persist. Gurukul model is the answer. At least, Gurukuls should be empowered at village level. Reservation in education and jobs has become a contentious issue these days, do you think the current system works or some different approach is required? The current system has only degenerated on qualitative parameters. Hence, in no way is it working constructively. As far as reservation is concerned, it is only a political instrument to divide. It is being played because people think education implies big buildings and infrastructure. If education is within, if education is about empowering the self – what has reservation to do with this; it hardly matters whether it is there or not. What stopped Dr. Abdul Kalam from becoming what he became? What can stop a farmer to innovate on his work, if he does so? Everyone thinks, his child is going to be rich as an engineer or a doctor only if he sits in a 3 star building – that is a different problem altogether. The reason the term Gurukul is gaining dominance at least in the perception of people today, it is because it addresses a wide range of problems including this issue. For parents who make a prestige issue in sending their kids to expensive, convent schools or those who give an argument of saffronisation of education, why should they consider Gurukul model? Your question has three different issues – status attitude of parents, saffronisation and Gurukuls. Status attitude of parents has developed due to westernisation of culture. Prevailing education has a role in it. Saffronisation has erroneously become a political and religious issue. Culturally, saffronisation is our core national identity. It has a deep meaning and connect with the spiritual growth of a society. Education should not have dropped it for any reason in the first place. Gurukul is not a model of consideration – it is a state of perfection in the field of education. If we go on improving any of the best operating education models in the world, we will finally create a Gurukul. Gurukul is not about choice, it is about reaching to the highest level of knowledge and practice. Who do you see as your role model and why? Our nation has produced endless heroes and leaders in all areas. Choosing a particular one is difficult. If I discount pre-Mahabharat era and limit myself only to four characters, my take is Chanakya, Shankaracharya, Chhatrapati Shivaji and Swami Vivekananda. All of them were saviours of our National Identity. All of them worked successfully to protect the core of our nation – Bharatiya or Hindu culture. If our education cannot give such strengths to sustain humanity, it is not worth. Future is infinite and hence no plans. I try to live on the philosophy of Bhagwat Gita – that guides us to live a righteous life without any attachments. The passion comes from the idea that we remain unaffected by success or failure. The passion is driven more by purpose of life and work for the betterment of all. Instead of future, our focus should be on leaving an impressive past. And that comes when you are established in Bhagwat Gita way of life. I strongly believe that while you work on poverty and employment, you cannot move ahead without spiritual unity of various cultures. Our nation presently is good in producing infrastructure, but weak in developing good culture at educational institutions. It is culture that sets the trend of excellence. Excellence is within an individual and a spiritual entity. Whenever we want good health, a good doctor is the primary choice and the hospital building is secondary. Similarly, for holistic development of the child, buildings should be secondary and qualitative development of the child should be our primary lookout. Proud of you Chanchal, Keep it up. 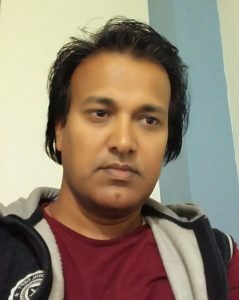 Chanchal sir is very great men, and very intelligent,person. Unique think and unique idea .really . Need to pay attention to what Chanchal says.